Anthracite is a compact variety of coal that was first burned as a residential heating fuel in the US by Judge Jesse Fell in Wilkes-Barre, Pennsylvania. It differs from wood in that it needs a draft from below. By burning it on an open grate in a fireplace, Fell proved that it could be a viable heating fuel. Fell's experiment took place 18 years after anthracite coal was said to have been discovered in Pennsylvania by hunter Necho Allen. Even if this or coal haven't been used for a long time already as a mainstream method to heat homes, you still can see the effects after many years all over certain classical buildings that got smoked for decades when everyone in cities were burning this stuff at home. 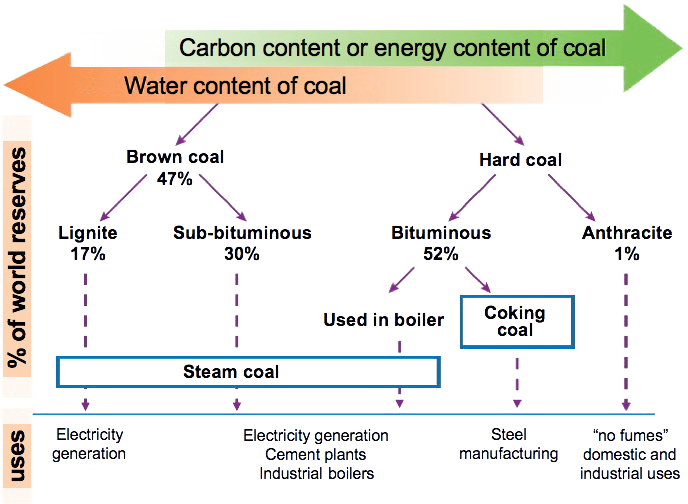 anthracite is quite clean-burning compared to other forms of coal. Anthracite derives from the Greek anthrakítēs (ἀνθρακίτης), literally "coal-like". The common term for Anthracite, where I was born and raised (former Yugoslavia), translates literally to "stone coal". In the place where I grew up, we mined mostly lignite. That "lignite" in thar's post reminded me of my youth, and I also realized that I had never learned the origin of the word. "imperfectly formed coal," 1808, from French, from Latin lignum "wood" (see ligni-). Brown coal that still shows traces of the wood it once was. Probably directly from Lithanthrax Lignius, name given to woody coal by Swedish chemist Johan Gottschalk Wallerius (1709-1785) in 1775.
sometimes ligno-, word-forming element used from late 19c. and meaning "wood," from Latin lignum "wood (for fuel or construction), firewood," from PIE *leg-no-, literally "that which is collected," from root *leg- (1) "to collect, gather." Related: Lignify; lignification. As remembrance of times past, here are two pictures. The steam engine was once part of technological revolution. The one in the picture is not particularly environmentally friendly. The origin of word "chauffeur" is related to the steam engine. 1896, "a motorist," from French chauffeur, literally "stoker," operator of a steam engine, French nickname for early motorists, from chauffer "to heat," from Old French chaufer "to heat, warm up; to become hot" (see chafe). The first motor-cars were steam-driven. Sense of "professional or paid driver of a private motor car" is from 1902. Legend has it that Necho Allen fell asleep at the base of Broad Mountain and woke to the sight of a large fire because his campfire had ignited an outcropping of anthracite coal.